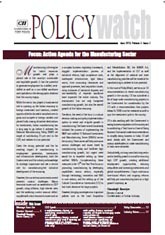 The June issue of Policy Watch takes an in-depth look at the agenda for reviving the Manufacturing Sector and has outlined some specific recommendations, which would help the sector to reclaim its rightful place in India’s growth story. Manufacturing sector, the key driver of the Indian economy, has witnessed a slowdown leading to a decline in industrial output over the year. This, in turn, has affected the overall economic growth, investments and employment generation in the country. Today several structural issues such as skills deficit, poor infrastructure and lack of labour reforms etc ails the manufacturing sector that is further compounded by demand volatility, cost pressures and falling investments. 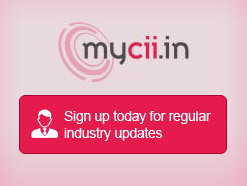 CII therefore continues to advocate with government at the highest levels to take steps for overcoming these challenges and creating an enabling environment for reviving and re-igniting manufacturing growth.